Monogram siding is a well-known vinyl cladding manufactured by CertainTeed. As a premium product, its thickness and fade resistance ensure quality, but can impact cost. Still, Monogram vinyl siding often costs less than many competing products or materials, making it a solid midline choice for budget-conscious homeowners. 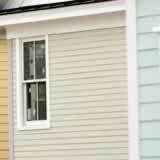 If your home has existing siding that needs to be removed, this can add an additional $0.50 to $1 per square foot. The bottom line: Expect to pay between $5.10 and $6.60 per square foot to have your old siding removed and Monogram vinyl siding installed. Home cladding is an important investment in your home, and choosing a premium vinyl product ensures quality, longevity and attractiveness. But while quality certainly carries a price, there are a few ways in which you can limit your final cost. Shop around. Request quotes from multiple contractors in your area to ensure you're getting the best deal. Consider your options. As noted in the quote above, deluxe- and premium-grade colors cost more than standard options. Do it yourself. Some homeowners can limit cost considerably by installing their own home cladding, An amateur job can cost more in the long run in terms of repairs and ongoing maintenance, however, so be certain you know what you're doing. There may be little difference from one contractor to another in how much Monogram siding costs, but some comparison shopping can still make a big difference in your bottom line. Which Certainteed vinyl siding is your style?